We will have a clothes dryer - eventually. 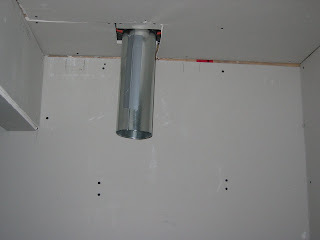 So it was necessary to think ahead and install the vent, as we wished to drywall the ceiling in the laundry room. It was a relatively easy task, given the ceiling and joist space were still open. Doing it later would have surely been a nightmare. Not sure what the dryer nor what vent opening would be I opted for an nice large 5-inch vent pipe. If the exhaust from the dryer is smaller I can always get an reducer pipe.